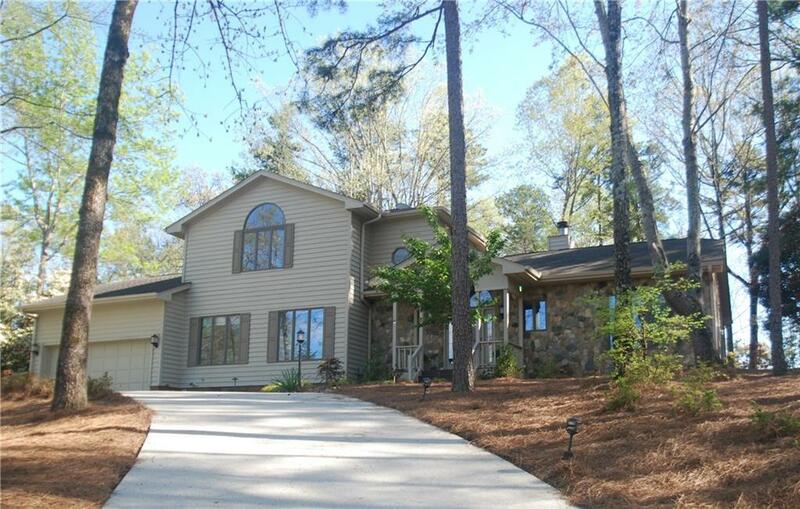 You will feel the spacious beauty you come to Keowee for. This 4 bedroom home has been meticulously maintained. As you arrive, your enjoyment begins; you will notice the beautifully landscaped yard, seasonal mountain and lake views and gentle sloped lot. Pictures canât do justice to this property, you must see. Upon entering you notice the beautiful hardwood floors in the vast great room with stone fireplace. The cathedral ceiling, windows and open spaces welcome you home after a full day of play with all of the amenities at Keowee Key or nearby hiking, mountains, and water activities. The dining area has a bay window and another gas fireplace to fully enjoy the seasons and views. Your kitchen updates feature stainless steel appliances, granite countertops and backsplash. The grand master bedroom suite has a double trey ceiling, separate tiled shower and jetted tub with dual sink. There is an enclosed three season room the owners describe as their favorite space to relax and enjoy the beauty and serenity of the property. Also on the main floor is an optional bedroom currently used as an office. This room has a Murphy bed which will easily convert the room to expand for friends and family that want to come play! The laundry room area has sink, large folding area and a large storage closet next to the two car garage. Upstairs are two extra large bedrooms, one with a cedar closet. This home is move-in ready; you can immediately enjoy âMore of what you loveâ in this great space. Seller is providing a 2/10 home warranty. Keowee Key has many outstanding amenities including an 18-hole golf course scheduled to re-open in September of 2019, a state-of-the-art fitness center, walking trails, two marinas, two outdoor pools, boat rental availability, a new Bistro dining area with indoor and outdoor seating, and a newly renovated club house that is scheduled to re-open in September, a dog park, waterfront walking trail, tennis, pickleball and many activities for everyone! There is a one time fees to a new home buyer purchasing in Keowoee Key of $2,426. The annual 2019 HOA fees for Keowee Key are $4,235. Information Deemed Reliable but Not Guaranteed- All numerical representations, including square footage and room sizes, are approximations only and are possibly inaccurate. If Buyer's decision to purchase is based upon numerical representations, Buyer shall be responsible for obtaining an independent measurement of structure and/or property.